Come join us Friday April 5th from 7pm-9pm at Dogwood for complimentary light bites and enjoy a signature cocktail for purchase! 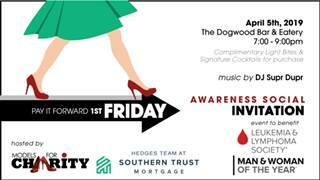 The Hedges Team at Southern Trust Mortgage is co-hosting and we will be there raffling off a door prize or two! And, as always, DJ Supr Dupr will be there playing all your favorite tunes. This month’s event with benefit the Leukemia Lymphoma Society – you may know them from their local Man & Woman of the Year event! LLS provides free information, education and support services for those who are impacted by blood cancer. They also fight for lifesaving policy changes at the state and federal level to ensure access to quality, affordable, coordinated care. And they work tirelessly toward their mission every single day, until they find a cure! Please bring a minimum $5 cash donation for entry. Grab your friends, your coworkers, your significant others, your gym pals and come out to support this good cause! We can’t wait to see you! Huge thanks to Dogwood and Southern Trust!